Hyundai is going to have a big presence at SEMA this year with a slew of custom cars and SUVs in its exhibit. 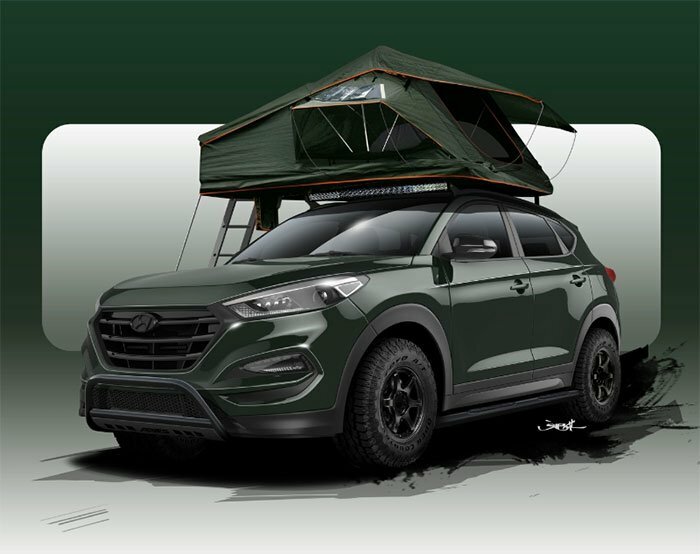 The latest to be teased is a 2016 Hyundai Tucson that has been dubbed the Adventuremobile. One of the biggest additions is a Treeline Tamarack roof-top tent for the car with room for two campers inside. The SUV also has Goal Zero solar panels to power accessories. On the outside, the SUV has an Aries bull bar and side steps along with Rigid Industries LED lights. A custom army green paint scheme and 1.5-inch suspension lift highlights the outside. Wheels are RAYS Gram Lights 57DR with Toyo Open Country A/T II tires. The Tucson gets more power with an AEM intake and charge pipe kit and Magnaflow exhaust. Inside the SUV is a custom Katzkin interior, custom seat belts, Yeti 400 solar Generator, lighting, and a recharger for gadgets. A custom audio system and a bunch of Scosche accessories round out the package. Rooftop tents are interesting, but seem like a strange way to spend the night. At least you won’t have to deal with bugs and snakes that might want to invade your space.